Neither I nor my dogs and cats were compensated for this post. We were given a few free samples of The Door Buddy™ that I used to test and for photos. 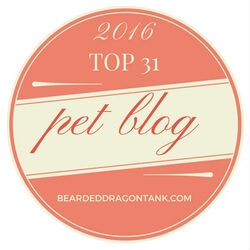 All opinions are mine, although the dogs and cats may have provided some commentary as I wrote. 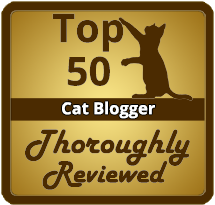 I only review products that I use or highly recommend to my readers. My dogs like to dig for buried treasure. And by buried treasure, I mean cat poop. Lilah, Jasper and Tucker must think it awfully nice of the resident felines to consistently leave these tasty snacks in their litter boxes for the dogs to find. 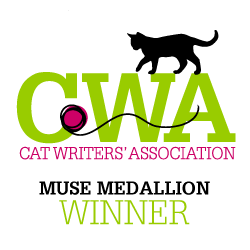 Love is not all that’s left in the litterbox by my cats – and yes, one of them did draw this lovely heart for me. Of course right after they feast on feces, the pups immediately want to kiss my face. Talk about potty mouth! Yuck. You look very sweet, Jasper, but I know where that tongue has been. Experts say you should have one more litter box than you have cats. Since we have four cats, there are five litter boxes in our home, all of which are in rooms with closable doors. The cats can chose to do their business in bathrooms or our finished basement. There’s also a box in my son Aaron’s room, where Dawn spends most of her time. The challenge? How to keep the dogs out of these rooms, and allow the cats free access. At first we used a combination of door stops and braces. I put a brick or other heavy object on the inside of a door , so it would only open so far before it hit something. This didn’t work too well, because we had to reach around the door while pulling the brick toward us and simultaneously closing the door just the right amount so that a cat could fit in but a dog could not. Not only was compliance among the humans inconsistent, but the dogs learned quickly that, with a little shoulder power, the door to the snack shop would open. Calvin ponders whether to leave the relative safety of the basement steps. 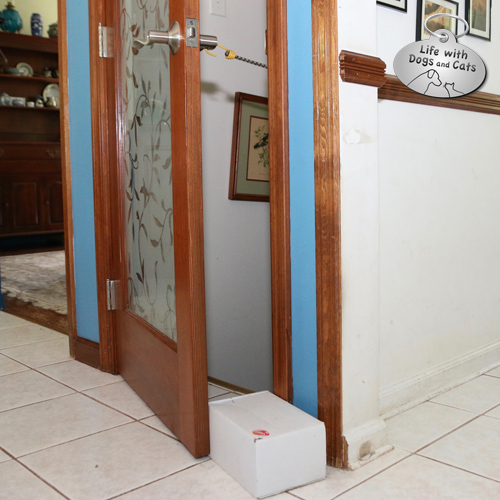 The beautiful boxes are there to prop the door open so he has access to the litter, and the dogs do not. We upped our game by adding bungee cord and door stop combination. Clever dogs figured out how to push through that, too. Bungee cord and box combination. Not very pretty — and it didn’t work too well either. 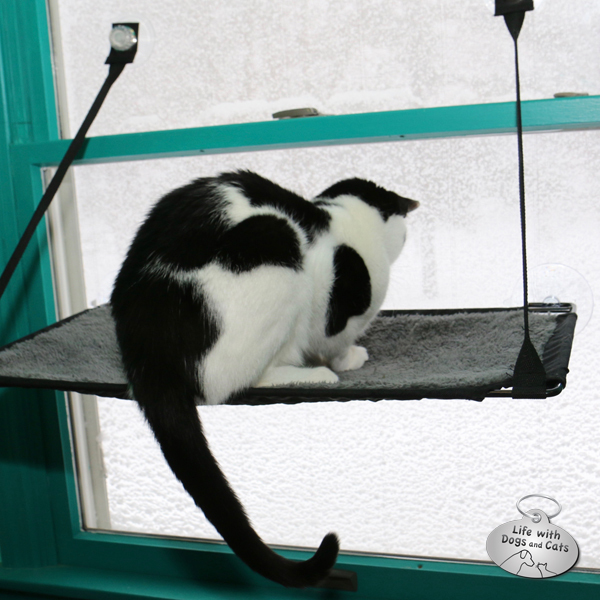 Then we tried using pressure-mounted baby gates, blocking off access to our laundry room and the bathroom where the most-used litter box was kept. The gate was secured about five inches off the ground, high enough for a cat and maybe a dog nose to go under, but not an entire dog. A pressure-mounted gate installed a few inches above the ground was another solution. Tucker and Jasper can get their heads under the gate, but not the rest of their bodies. That worked, but it was incredibly inconvenient; every time we left the house, did our laundry, walked out the back door, or used the downstairs bathroom, we had to take down the gate and put it up again. Take down the gate and put it up again.Take down the gate and put it up again. That got old real fast. Calvin easily crawls under the gate. I scoured the internet for solutions. Surely, I was not the only one looking for an answer to this problem. I found a special door latch called a Peek a Boo, that featured a long metal hook to kept the door open just enough for a cat to fit through, but not for my dogs. It was kind of ugly, but it was worth a try. My husband installed one as a test, drilling holes in the door and the jamb. We tried the Peek A Boo door latch, and while it did work for a while, Tucker figured out that if he banged the door hard enough, he could knock the latch out of it’s spot. This latch was nothing more than a food puzzle for my determined terrier Tucker. He figured out that if scratched and banged at the door long enough, he could dislodge the hook. Or he just squeezed his way in and back out again. Tucker is proud he was able to solve the puzzle, even if he destroyed the door in the process. 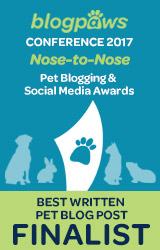 Then, at the Cat Writers’ Association / BlogPaws conference in June, I found the solution. 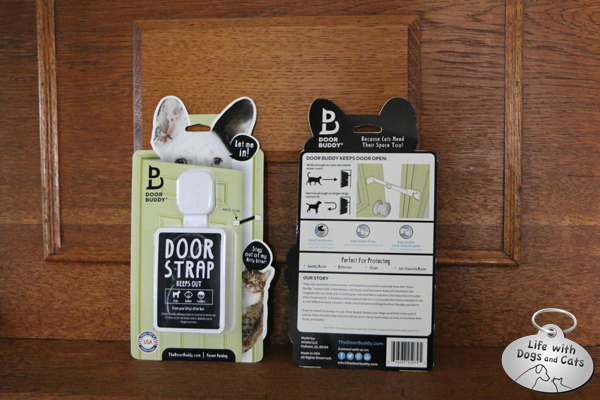 In each of our swag bags was a Door Buddy, an adjustable, inexpensive latch / strap that requires no tools to install. Door Buddy door strap to the rescue! 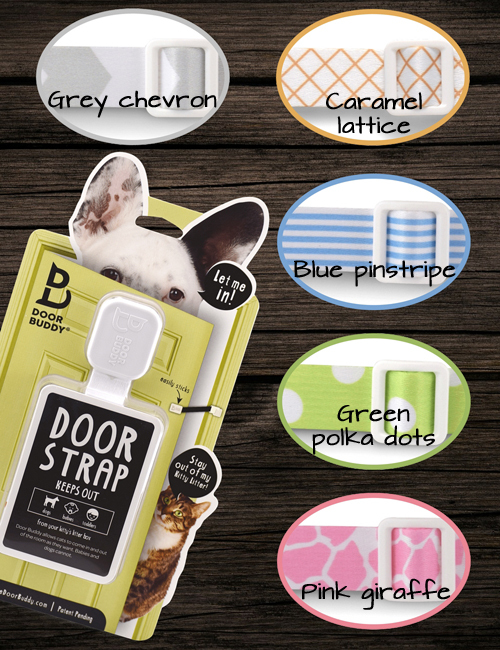 Retailing for $14.97, Door Buddies come in several color styles to match your decor. They install with a 3M adhesive that holds really well. So well that when Aaron forgot the Door Buddy was hooked and he yanked open his door, the latch stayed fixed, pulling a large paint chip along with it. That was easily repaired by gluing the paint — with the latch still attached — back to the wall. Since the hook itself is long, Tucker can’t bang it open. 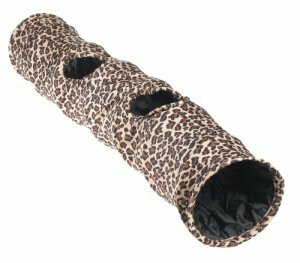 And, because the strap is adjustable — unlike the Peek a Boo — I could make the opening too small for any of my poop hunters to get through. Since the Door Buddy doesn’t hold a door open — it just restricts how wide it opens — at first I was concerned that one of the doors would get banged shut, and trap a cat in a bathroom. That never happened. The closest we came to that was when one of our dogs walked by the basement door and knocked into it, but the door didn’t close all the way. Besides, all my cats have learned how to push open doors that aren’t secured. 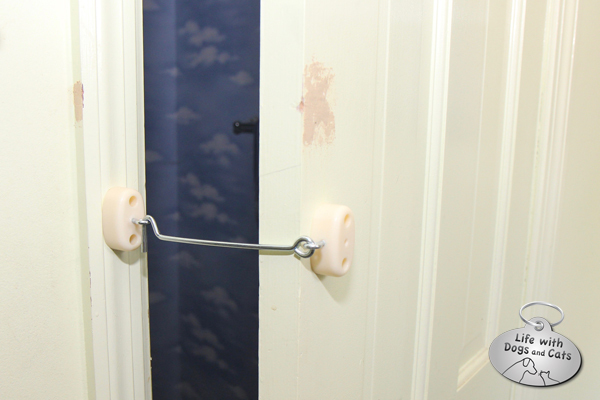 If you’re worried about that, though, the Door Buddy people also sell Pinch Guards that prevent a door from closing all the way. They thought of everything. Jasper can peek his head in, but can’t open the door. I now have Door Buddies on every door that leads to a litter box. The nice folks at Door Buddies have offered to give three lucky readers a set of Door Buddies. Enter the sweepstakes below for your chance to win. Please note: while the Door Buddy works for it’s intended purpose, please don’t use it to keep aggressive dogs confined, or as a way to keep dogs and children separated. Also, it helps to train your dog as well, using positive training techniques. 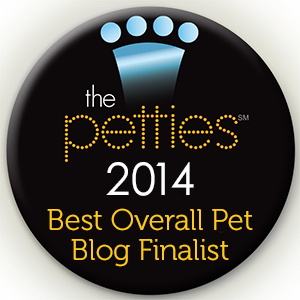 Read my story on Dogster.com for additional ways to keep dogs out of the litter box. 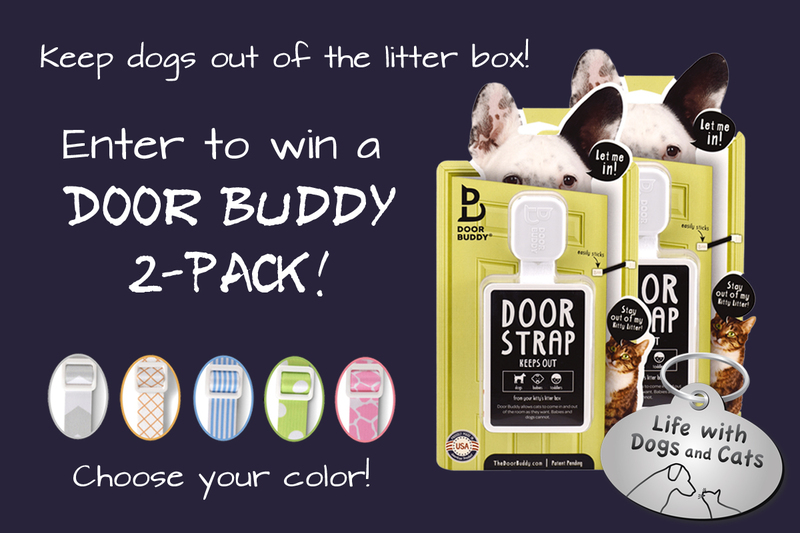 The Door Buddy strap comes in several colors. Please read full sweepstakes rules. 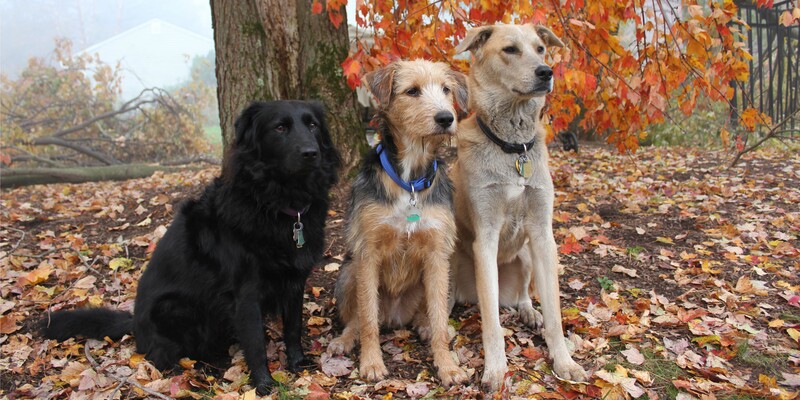 12 Comments on "Finally, a Solution to Keeping Dogs Out of the Litter Box: The Door Buddy"
we like the caramel lattice color. we don’t have dogs, but we do have a friend who would love to put these to use to keep her dogs away from her one very skittish cat!! 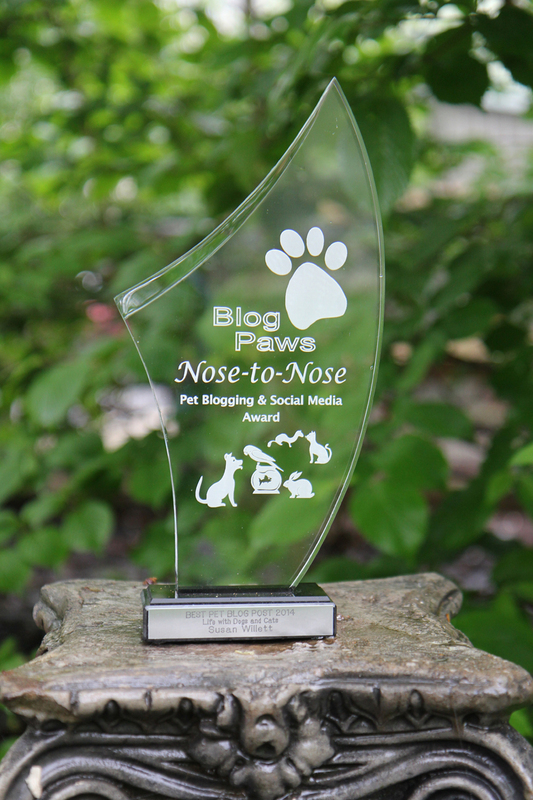 Thank you so much Susan for this awesome post on Door Buddy! 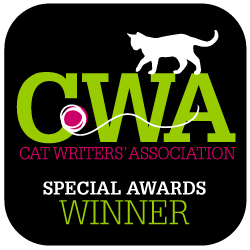 We really appreciate it and hope this will help give dog and cat owners some relief from a very real and yucky problem that is more common than most people would think. We just put the litter box up on the counter in the laundry room. The cats get the jumping exercise and the dogs can’t get it. The Strap would help when my schnauzer has puppies, it will keep my 4 year old from running in there whenever he wants and letting my puppies out! I would like the gray colored one!